The Western Red Cedar Porch 5' Swing seats two comfortably, measuring approx. 23" high x 64" wide x 27" deep. 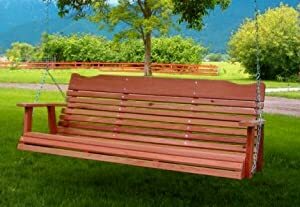 This extra wide traditional natural wood swing comes with comfortable contoured seating, chain and springs. All the swing needs is a view. Our cedar furniture is shipped partially assembled, with easy to follow instructions. The 5' version has a 2nd set of seat crosses/back crosses - which further strengthens our already sturdy swing. The 5' version fits both larger folks and larger spaces on your porch. We also have available a 4' wide version. All of our patio furniture products are made from natural tight knotty Western Red Cedar with non-staining hardware. Western Red Cedar is lightweight, dimensionally stable, and naturally resistant to splitting, cupping, and warping. Western Red Cedar gives our patio furniture strength, beauty & natural resistance to the elements. **We are using Silicone Magic, with a cedar tint to enchance the finish. It is Ecologically safe, water based, clear drying, penetrating and highly flexible film. Extensive breathability, allowing air to escape from substrate. Silicon Magic has excellent water-repelling characteristics for long term protection. Additonal properties include excellent resistance to mildew, chemicals, and UV with exceptional additives for UV, mildew and insect protection. as well as color enhancement. As with any finish, the wood will darken a bit, but will bring out the red found in the cedar's grain. ** Are you thinking that your porch may not be right for a swing? Please take a look at our compact self-contained cedar gliders. We also sell unfinished swings. We ship by UPS ground only within the Continental US - sorry we don't ship to Alaska, Hawaii nor outside the United States. Shipping is added to all furniture orders.